A few years ago, I decided I had to have a copy of A Return to Cooking . As luck would have it, it wasn’t easy to find a new one, but I finally located one online. Earlier this year it was released in paperback with a new cover. I’m not sure if the this new version contains updated information or a new intro or if it’s just a paperback version of the original. The book is about Eric Ripert getting back to what he loves about cooking as he prepares meals away from the restaurant in four different locations. For the winter segment of the book, he cooked in Puerto Rico, and the tropical influence on those dishes made them very appealing to me. At the beginning of the chapter, Ripert described pique which is a sweet, spicy condiment made from fermented pineapple stock, chiles, and garlic. He mentioned it’s used on fish at Le Bernardin, and he planned to use it in several dishes while cooking in Puerto Rico. I had been thinking about pique and had wanted to try making it since I first the read the book. I never found the time or worked up the courage to try it until recently. I’ve never seen pique bottled, and I’ve never heard other chefs or food writers mention it, so all I knew was what was in this book. Two weeks ago while shopping at Whole Foods, I spotted a pile of organic pineapples and decided it was time to make pineapple stock for pique. I followed the instructions exactly. Pineapple skins were boiled and then strained. That stock was added to a jar with hot Thai and habanero chiles, garlic, oregano, and peppercorns. It was topped with a barrier of olive oil and was left to ferment for one week at room temperature with a cheesecloth covering. Bubbles should have formed and then subsided after a week. No bubbles formed in my pique. It sat, did nothing, smelled like garlic, and the chiles started looking less than appetizing. I decided to play it safe and dump the pique. So, I still don’t really know anything more about this condiment. I had hoped to use it as suggested in the crab salad with chilled gazpacho sauce, but rather than risk a nice bout of food poisoning, I made a substitution instead. Maybe I’ll find a source to purchase pique one of these days, or I might just have to hop on a plane to learn more about it. In the book, this dish is a lovely, light-colored, delicate-looking thing. What I created is far more garish with a vivid, red sauce, and the darkest green avocados I’ve seen for a while. The topping on the crab salad was supposed to have been finely diced, peeled, green tomatoes. Unfortunately, I arrived a little late at the farmers’ market last weekend, and not only did I miss any chance at finding green tomatoes I almost didn’t get tomatoes at all. One farmer was kind enough to offer me his over-ripe ones that no one else wanted. They were red, juicy, and perfect for pureeing into gazpacho, so I took them. For the topping, I finely diced some seeded, yellow cherry tomatoes and combined them with finely diced, seeded cucumber. It might not have been exactly the flavor that was intended, but the color contrast and the taste of cucumber worked nicely with the dish. Those vegetables were added to finely chopped, preserved lemon, lemon oil, a spicy vinaigrette which I used instead of pique, and salt and pepper. For the sauce, chopped, very ripe in my case, tomatoes were pulsed in the blender. Ripert suggested pulsing so as not to incorporate too much air. The puree was passed through a strainer, and it was seasoned with sherry vinegar and salt and pepper, and that was the sauce. For the crab salad, mayonnaise was whisked with some vinaigrette, chopped chives were added, and lump crabmeat was gently stirred into the mix. To match the presentation in the book, a ring mold was needed, but I used a biscuit cutter. 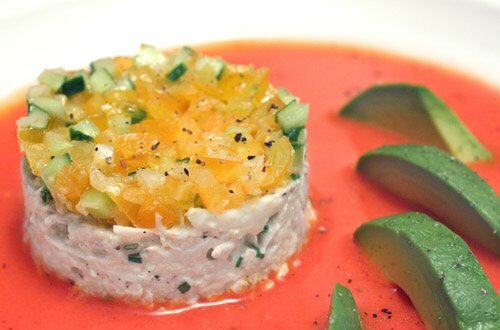 The crab salad was molded on the plate inside the biscuit cutter with the yellow tomato-cucumber mixture on top, gazpacho sauce was poured all around, the biscuit cutter mold was removed, and sliced avocado was added. Despite how fussy it sounds and how pretty it looked in the book, it was actually very easy to prepare. Because each part was chilled before being plated, it made a refreshing first course for a summer night’s meal. How can I not love your blog when there are so many wonderful food here! Such a gorgeous presentation Lisa. I am sure it tastes delicious too. Love both combination. YUM! I love how that looks. Much more tantalizing than that mess on a plate you get when you have any seafood salad. The contrast of the topping is lovely. sorry about your pique...if it makes you feel any better, i tossed about 1/2 a dozen jars of fermenting pickles the other day. live & learn...and keep up the good work! This dish is so lovely that it helps make up for the pique letdown. It is rather frustrating when you follow instructions to a 't' and it doesn't work! But at least you actually tried it and I have no doubt that in time, you'll give it another go! Whoa, that is SO fancy looking. Like something from a swank chef's tasting menu! Beautiful, colorful and flavorful! A wonderful recipe! Wow, this sounds delicious and your presentation is beautiful, a recipe to compete in a gourmet restaurant. You'v done ti once again. I must get me some crab to full this crab craving you've cast on me because of this salad. Wow, this looks like eating in the restaurant! I was looking at a crab salad recipe the other day and have to find some good ones in my surrounding, don't like cans. No kidding - I've been trying to track down this book too. I had no idea it had been re-released, and I'm sort of excited -- but I sort of wanted the original. Still, I'm going to order a copy as soon as I get done posting here :) That's some seriously beautiful food you've prepared this time -- delicate and complex and darn mouthwatering! even with pique issues, this dish looks spectaular what a wonderful looking recipe, and of course crab is one of m favorite ingredients. Beautiful! How can this not be good when it's an Eric Ripert's recipe and Lisa's recommendation? I'm currently in Bangkok where crabmeat is fresh, plentiful, and cheap, and I'm seriously considering making this. 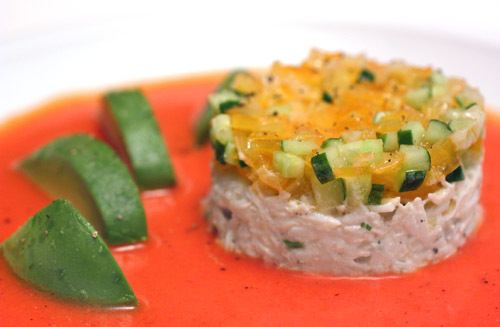 admittedly, i'm not crazy about the crab part of this, but i love the presentation and i love the tomatoes on top. very lovely dish, lisa! A fabulous crab salad and I love your gorgeous presentation! Very nice! This is a fabulous way to serve crab! I love it! Delicious and beautiful! This is absolutely exquisite. I must make it. So perfect for the heat and crab is just my favorite! The pique sounds fabulous -- I'm quite disappointed that it didn't work for you, and will be VERY interested in your repeat attempts. Overall, though -- this meal looks far from disappointing. Fresh and summer... love it. What a gorgeous presentation, i would have not known that you had problems with this. This is stunning...love the Gazpacho sauce for colour and flavour. Crab salad is so interesting. Love how you can make any meat into a salad. I certainly looks like an interesting combination of flavours. Great for an appetizer indeed! This dish looks so delicated and well-presented!! The taste must be good as well. That looks great! The flavours sound like the would work perfectly too. Wow that looks so good! 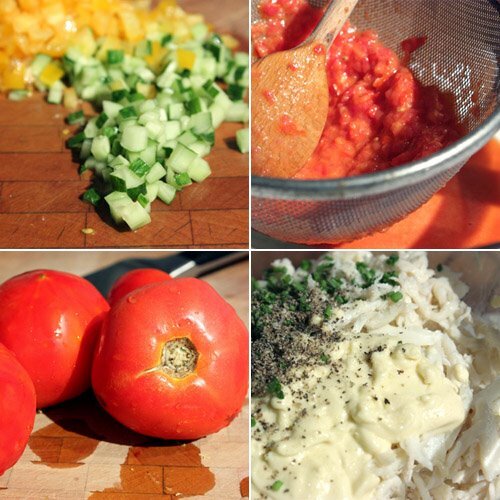 I love pasta and the tomatoes give it so much color! This looks great! Light and delicious with the flavors of summer. How fresh and pretty, it looks like something you'd get at a restaurant! Your plating is always so pretty. This looks so fresh and delicious. The presentation is wonderful! Sounds like a really refreshing and flavourful dish!